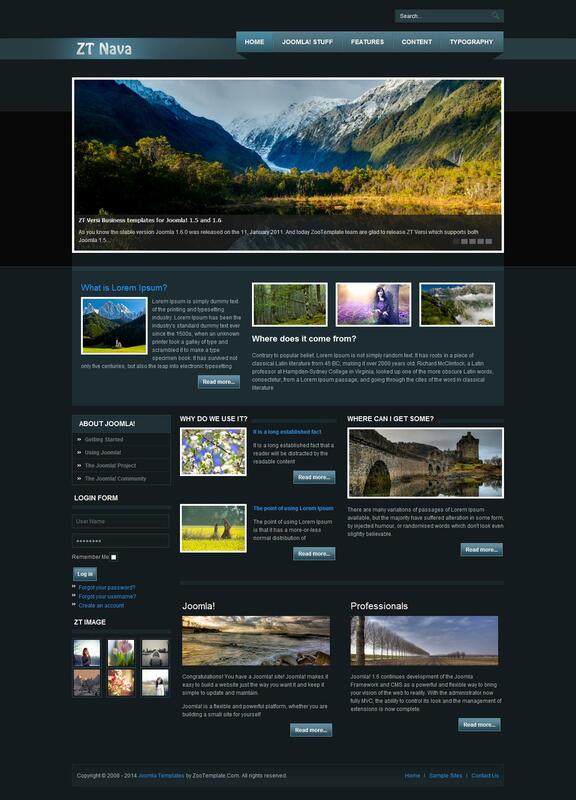 ZT Nava - universal template for sites controlled by CMS Joomla 1.5, 1.7, 2.5 from the studio ZooTemplate. Template ZT Nava is well optimized, has a control panel where you can set the site menu, font size, etc. The template ZT Nava preinstalled more than 30 positions to accommodate modules, allowing you to easily create a website of any complexity, from malostranichnogo / personal site to a large Corporate Internet community. Template ZT Nava is compatible with all third-party extensions, among which are - K2 and Kunena forum (first - for managing content on the site and build an online community forum for the second). Template ZT Nava does not create heavy loads on the server, it is easy to set up and adapts to any subject site.